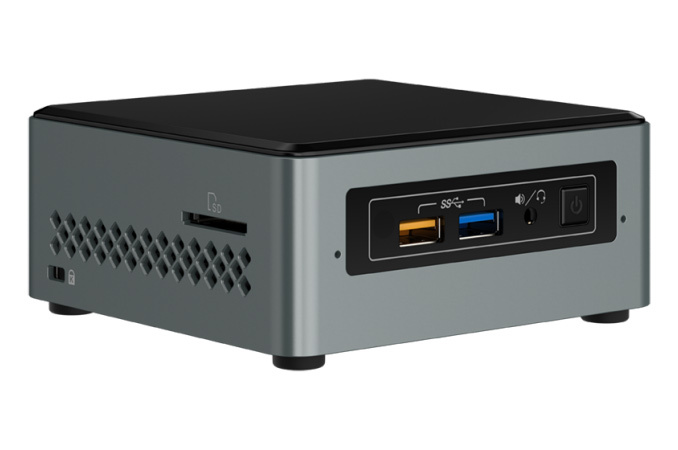 Intel has quietly published detailed specifications of miniature NUC systems based on the Apollo Lake platform on its web site. As revealed earlier this year, Intel offers two systems that can be used for both everyday computing as well as for media playback in the living room. The publication of details indicates that Intel either has started to ship the systems to customers or intends to begin their shipments in a short while. Intel’s family of NUCs based on the Apollo Lake platform, codenamed Arches Canyon, consists of two systems: the NUC6CAYS and the NUC6CAYH. Both systems use the Intel Celeron J3455 processor (four Goldmont cores clocked at 1.5/2.3 GHz, 2 MB cache, dual-channel DRAM controller, HD Graphics 500, 10W TDP) that feature Intel’s ninth-generation graphics architecture (Gen9) as well as improved media playback engine with hardware-accelerated playback of 4K video encoded using HEVC and VP9 codecs. The Intel NUC6CAYS is a fully populated PC that works out of the box and comes with 2 GB of DDR3L-1866 memory, 32 GB eMMC storage (from SanDisk, SK Hynix or Kingston), a wireless keyboard as well as pre-installed Windows 10 Home x64 OS. By contrast, the Intel NUC6CAYH comes as barebones, requiring DRAM and storage to work. Other than that, both Arches Canyon systems are exactly the same: they support up to 8 GB of DDR3L memory, one 2.5”/9.5 mm SSD/HDD, a 1x1 wireless module supporting IEEE 802.11ac Wi-Fi and Bluetooth 4.2, a HDMI 2.0 display output, four USB 3.0 Type-A ports (one supports charging), an SDXC card reader, a TRRS mini-jack for audio and so on. One of the noteworthy features is that the entry-level NUCs have a D-Sub connector on the back to allow connectivity with cheap displays and other applications that use this header. Typically a legacy port is done at a request of one of their large customers, and/or the company intends to sell the new NUCs in developing countries. Given the rich multimedia capabilities of Intel’s latest Apollo Lake SoCs, HDMI 2.0 connectivity as well as compatibility with 2.5” storage devices, the Arches Canyon NUCs could serve quite well as 4K-capable HTPCs. Still, keep in mind that the systems only support HDCP 1.4/1.2 and PAVP 2.0 and thus will not playback Ultra HD Blu-rays even if equipped with an appropriate external drive. At press time, the Intel NUC6CAYS and the Intel NUC6CAYH SFF PCs were not available for sale anywhere. Official MSRPs for the systems are unknown, but one of the online stores known for taking pre-orders on unreleased items lists the NUC6CAYS for $225 and the NUC6CAYH for $158. The prices are relatively high for these kind of PCs, so we expect the actual MSRPs to be lower.